I know, you wouldn't believe it but I spent my Saturday morning on my first weekend in Singapore looking for a laundry shop. HAHA! Lucky for me, Eli went with me. We found Laundromat in the internet, a coin-operated laundry shop. Sa loob ng mall ito!! Hehe. We then went to Funan Mall. Daming gadgets! I did not buy any. Totoo! :p To end our mall hopping weekend, we went to hear a mass in St. Andrew's Cathedral. mall parang river sa loob ng mall?astig! @avagabondmom Yes, was able to try the ice cream sandwich only. Hehe. @Apple Teh, nandito pa. Nakalimutan ko ibigay nung nagkita tayo. HAHA. A great place to wash your clothes,Reasons to Use a Coin Laundry, Long hours of operation.Friendly dry cleaning in Singapore! 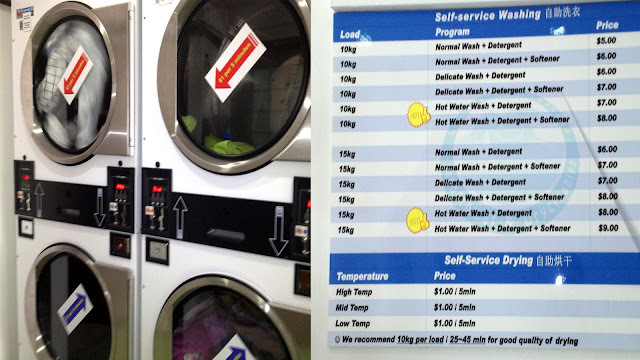 Affordable prices.Coin Laundry Singapore (aka Mr Dobi).